Don't spend time fighting with your wine bottle when you could be drinking it. With our high-quality winged corkscrew, you can remove even the most difficult of corks. This will be the best wine opener that you have ever owned. Simply place the corkscrew over the bottle, and screw the worm into the cork. As you do this the wings will raise, and once the worm is fully inserted, you push the wings down and easily remove the cork! Our design features a longer body and bottleneck than most corkscrews, along with the actual corkscrew (not a cheaper helix screw) ensuring your cork never breaks. ✔️LOW EFFORT - With a 2 inch ergonomic twisting handle and 3 inch wings with rubber grips our corkscrew makes it easy to remove even the toughest corks. 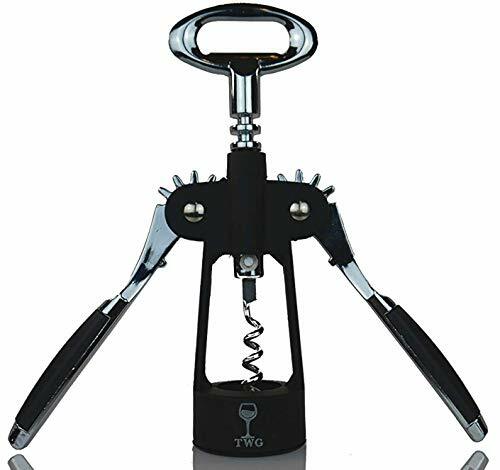 ✔️ WON'T DESTROY YOUR CORK - Our opener is made with a traditional corkscrew worm for ease of use, not the tough to insert helix screw known to destroy wine corks. ✔️ DUAL PURPOSE - Our handle also makes the perfect beer bottle opener! With our sturdy design and strong materials you will make quick work of any bottle top. ✔️ LIFETIME WARRANTY - Love it (we are certain you will), or we will buy it back, no questions asked! If you have any questions about this product by The Wine Guys, contact us by completing and submitting the form below. If you are looking for a specif part number, please include it with your message.